WEST HOLLYWOOD—The driver of a Toyota Prius was killed on Monday, April 27 after his vehicle collided with a parked mobile construction crane in West Hollywood. At approximately 4:15 a.m., the driver, identified as 21-year-old Brandon Gonzales, was driving eastbound on Sunset Boulevard near the intersection of Sweetzer Avenue when he struck the parked crane. 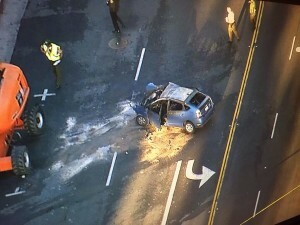 21-year-old Brandon Gonzales was traveling eastbound on Sunset Boulevard in West Hollywood when he crashed into a parked construction crane. Gonzales received treatment from responding paramedics and was transported to Cedars-Sinai Medical Center. He succumbed to his injuries soon after his arrival to the hospital. Sunset Boulevard was shut-down between Sweetzer Avenue and Olive Street during the clean-up and investigation of the crash site. The exact cause of the crash has not yet been disclosed.